Toronto's CN Tower is one of the Seven Wonders of the Modern World, and when adding in the height of its antenna on top, it’s the tallest freestanding structure in the western hemisphere. If you want to be higher than the birds, get ready to take flight and zoom up to the top of this iconic building. If you are scared of heights, don’t look down. 1. THE GLASS FLOOR OF THE OBSERVATION LEVEL CAN WITHSTAND THE WEIGHT OF 35 MOOSE. Go ahead—jump up and down! The CN Tower's Glass Floor was designed to be strong, and can withstand the weight of 35 moose. Load tests are performed yearly (no, not with actual moose). The solid glass is actually five times stronger than what is required for weight-bearing commercial floors, and has the picturesque bonus of being situated 113 stories above the ground—perfect for a selfie. 2. TWICE A YEAR, YOU CAN TAKE THE STAIRS ALL THE WAY UP. Fair warning for interested parties: that is a total of 1776 stairs (144 flights). Each year, the CN Tower hosts two fundraising stair climbs—one for the World Wildlife Fund of Canada, the other for United Way of Greater Toronto—that attract more than 20,000 participants and raise more than $2.5 million annually. 3. THERE'S A TIME CAPSULE IN THE WALL OF THE TOWER'S LOOKOUT LEVEL. As part of the tower's grand opening in 1976, a time capsule was placed in the wall of the building's LookOut level. Included in the time capsule are copies of three local newspapers, Canadian coins, letters from children, and a letter from then-Canadian Prime Minister Pierre Trudeau (the father of current Canadian Prime Minister Justin Trudeau). The plan is to open the capsule in 2076. 4. ON A CLEAR DAY, YOU CAN SEE NIAGARA FALLS FROM THE TOP. 5. IT'S A TARGET FOR LIGHTNING. 6. IF YOU'RE DARING ENOUGH, YOU CAN LEAN BACK—HANDS-FREE—OVER TORONTO. Adventurous types can sign up to experience the tower's EdgeWalk, which allows you to take a stroll along a five-foot-wide ledge on the top of the building's main pod—outside. You are attached to an overhead safety rail and harness system, which allows you to physically lean back for a great view of Lake Ontario. It's definitely not for the faint of heart, and it doesn't come cheap. Tickets are $195 (though that comes with a video to prove to your family and friends that you actually did it). 7. THE TOWER'S COLORS ARE CONSTANTLY CHANGING. 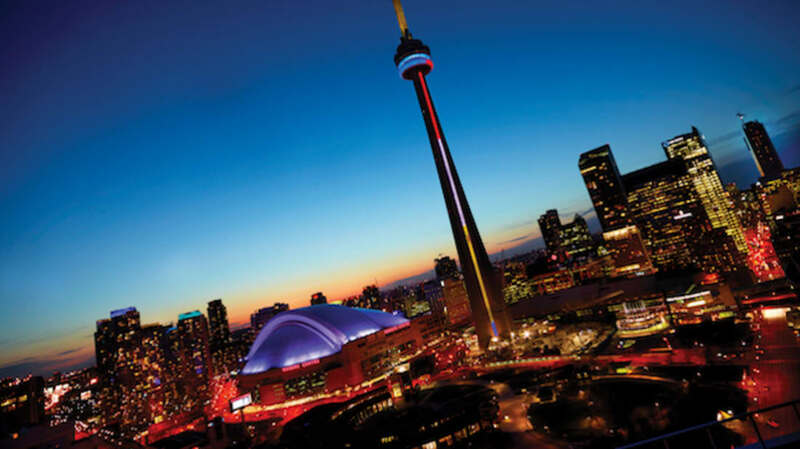 The CN Tower's funky LED illumination light system is energy-efficient, low-maintenance, and free of UV radiation. It can also be controlled and directed, meaning that the Tower's colors regularly change; it goes green for Earth Day, turns blue for the Toronto Blue Jays's home opener, and becomes red and pink for Mother’s Day. This system also lets the city pay tribute to events around the world; in 2015, following the terror attacks in Paris, the tower was illuminated with the colors of the French flag—red, white, and blue. 8. IT'S GOT THE CLEAREST RECEPTION IN NORTH AMERICA. 9. IT'S HOME TO THE WORLD'S HIGHEST WINE CELLAR. In 1997 the “wine cellar in the sky” opened at 360, a revolving restaurant at the top of the tower. In 2006, Guinness World Records dubbed it the world's highest wine cellar (it's situated 1151 feet above the ground in Toronto). It can hold an impressive amount of vino, too—up to 9000 bottles. Cheers! 10. LAST YEAR, TWO DAREDEVILS JUMPED FROM THE TOP OF THE TOWER. In 2015, as part of the Pan Am Games, French BASE jumpers Fred Fugen and Vince Reffet surprised onlookers when they jumped from the top of the tower while film crews and a crowd looked on. (Yes, they had parachutes). All images courtesy of CN Tower unless otherwise noted.